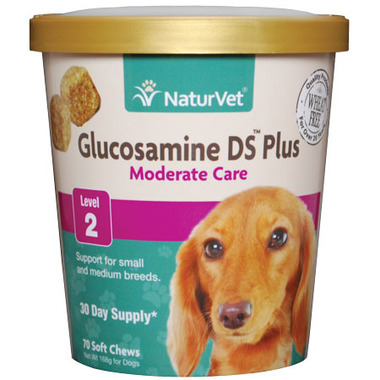 Naturvet Glucosamine DS Moderate Care Soft Chews are designed to help maintain healthy, normal cartilage and joint function in your active dog. These soft chews help support the structural integrity of joints and connective tissue your dog needs to stay active and happy. Active Ingredients (Per 2 Soft Chews): Glucosamine (Shellfish Source) (500 mg), Methylsulfonylmethane (MSM) (500 mg), Yucca Schidigera (60 mg), Chondroitin Sulfate (Porcine Source) (60 mg), Calcium Ascorbate (Vitamin C) (58 mg), dl-alpha Tocopheryl (Vitamin E) (60 IU), Omega 3 Fatty Acids (1800 mcg), and Omega 6 Fatty Acids (946 mcg).